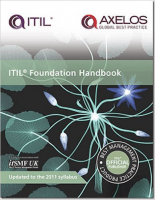 Now updated in line with the 2011 syllabus and endorsed by APM Group, the official ITIL Accreditor, the ITIL Foundation Handbook is a quick-reference revision guide designed to help students prepare for their foundation exam. It is also a key reference aid for managers, practitioners, vendors and consultants in the workplace and while travelling. This handbook provides an introduction to the ITIL service lifecycle model and an overview of the ITIL qualification structure. It contains a chapter on each of the components of the lifecycle: service strategy, service design, service transition, service operation and continual service improvement.